Fall is here – and apples abound; so I dug through my hundred-year-old cookbooks looking for the perfect apple recipe. 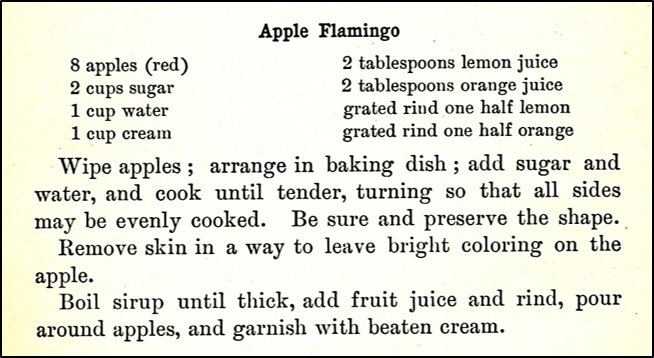 I found a recipe for Apple Flamingo, and think that I found a winner. Apple Flamingo is basically a baked apple with the skin removed following baking. Red apples are used in this recipe, so the cooked apples take on a bit of the color from the apple skins, and have a lovely reddish hue. 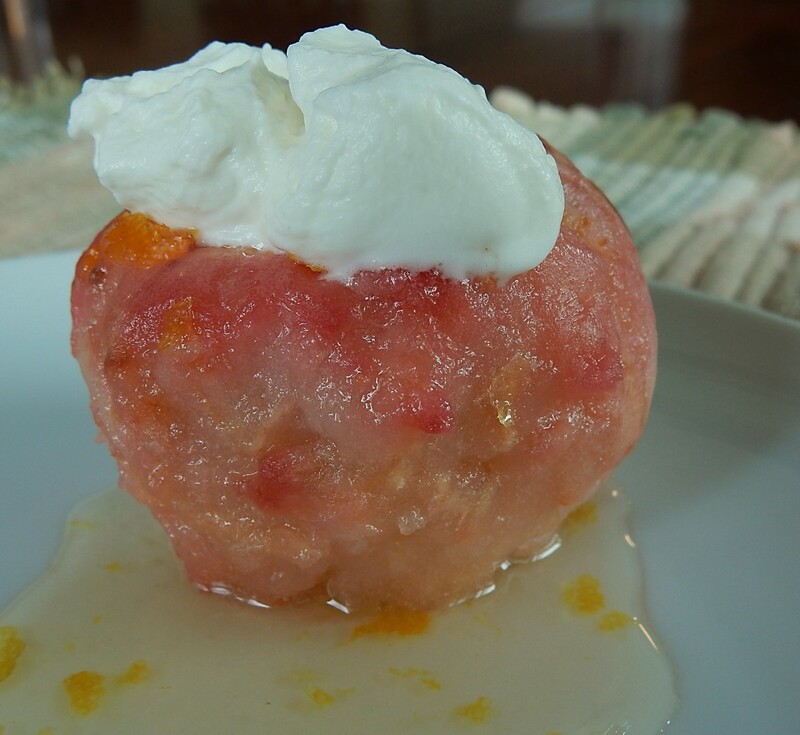 The apples are served with a citrus syrup that contains bits of lemon and orange zest, and are topped with whipped cream. Apple Flamingo is delightful and seems almost decadent. This apple and citrus dessert is a welcome change from the usual cinnamon apple desserts. In the meantime, make the sauce by putting the sugar and water in a saucepan; stir to combine. Bring to a boil using medium heat, then reduce heat and simmer until the liquid thickens into a syrup (about 10 minutes). Remove from heat and stir in the lemon juice, orange juice, grated lemon rind, and grated orange rind. Also, in the meantime, make the whipped cream. Place the whipping cream in a bowl and beat until stiff peaks form. Add confectioners sugar, and continue beating until thoroughly mixed. To serve, spoon sauce over the baked apples. Top with the whipped cream. Serve warm. Note: This recipe makes a lot of the citrus sauce. I had some left-over when I made this recipe, so I baked several additional apples the following day. I put a little confectioners sugar in the whipped cream. The original recipe didn’t call for adding any sugar to the whipped cream, but I thought that the whipped cream was tastier when sweetened a bit. Posted on October 15, 2018 October 14, 2018 by SherylPosted in FoodTagged apple, recipe. I haven’t baked apples in years and years. This might be fun to try, and a nice alternative to the old raisins-and-nuts routine. Mmm. Sounds good. I’ll try this. The baked apple is beautiful. I cook apples often, but I’ve never yet spent that much time on them. Kudos to you! This looks beautiful and I bet it tastes amazing too. I am very interested in baking. Thank you so much for sharing. Oh my,not only is it appealing to the eye,it’s sounds good too! It’s so pretty! I like the sound of the citrus sauce, too–I wonder if it would be good on pound cake . . . I had never heard of an Apple Flamingo, but it looks so interesting! How pretty! This would make a nice fancy dessert display. It must be the color that gives it such a fun name. That is a keeper. Thanks for sharing.